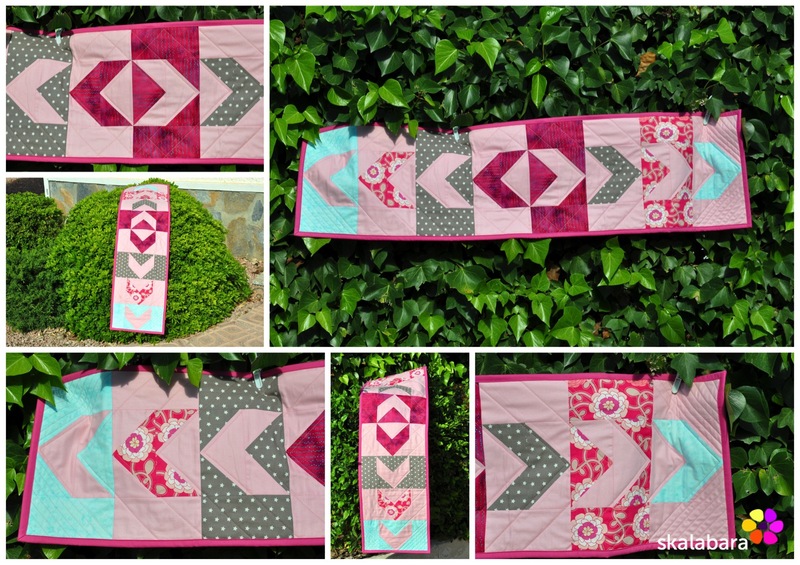 Over the last few weeks I have finished some mini quilts for decoration at Kate’s new shop. 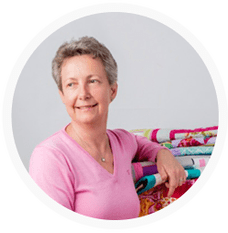 Yes, Kate from our local patchwork and craft shop has moved to new – larger and brighter premises. And I thought mini quilts would be the right present for a new shop. 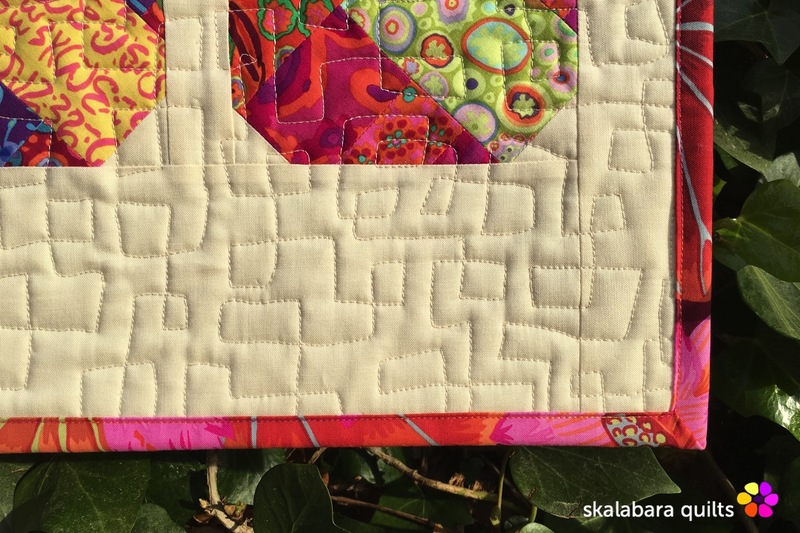 I have practiced a new free-motion quilting pattern with squares/rectangles instead of a curvy, meander style. It was a bit challenging at first, but only practice helps to get more confidence with free-motion quilting. 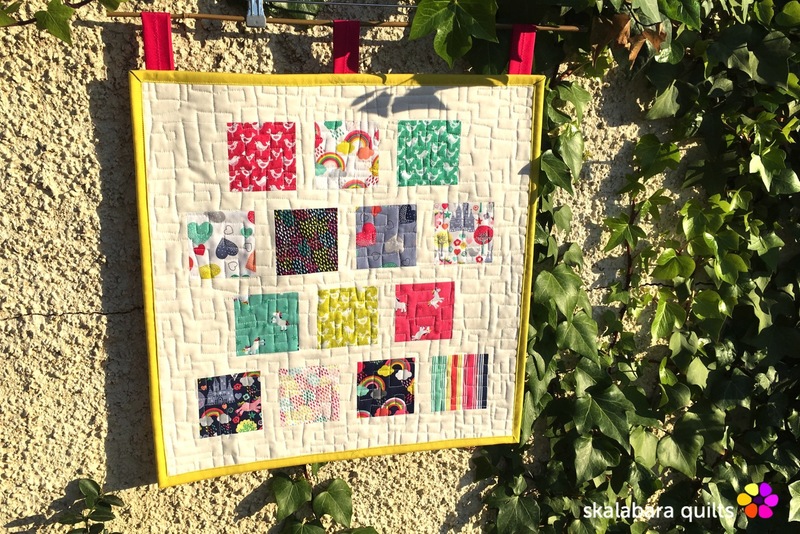 I was really happy with my first “squary” free-motion mini quilt finishing. Not perfect, but nearly. 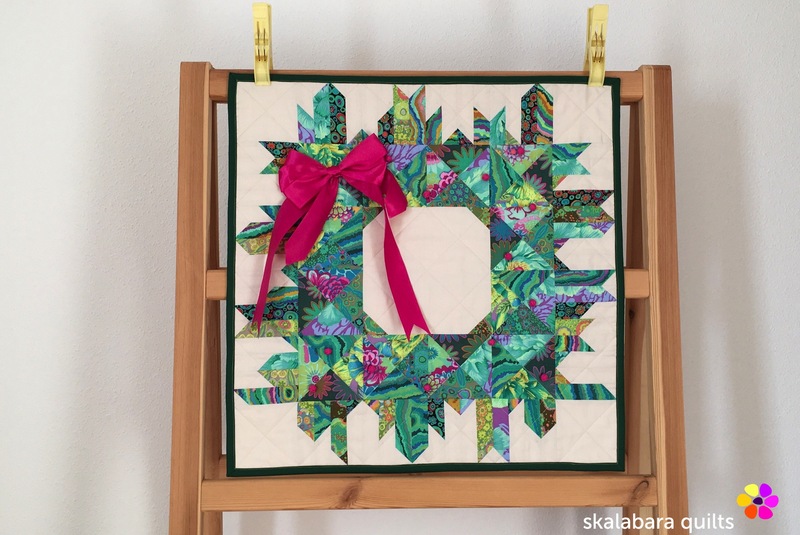 The pattern is by Elizabeth Hartman – Pineapple Farm. Last year I have made with the same pattern a table runner for my sister-in-law as a Christmas present. 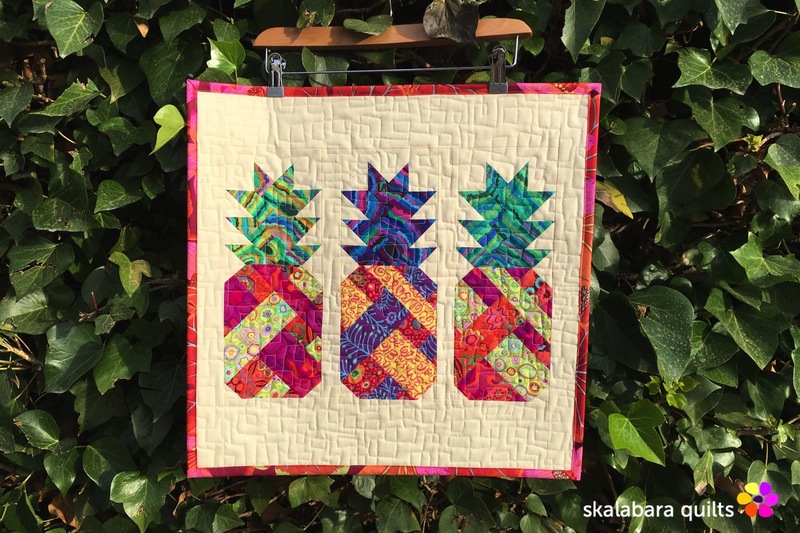 I have used the leftover cuts from both pineapple minis to create a raw edge triangle application design that is framed with dense pebble-free motion quilting. And photos from the design and sewing process. 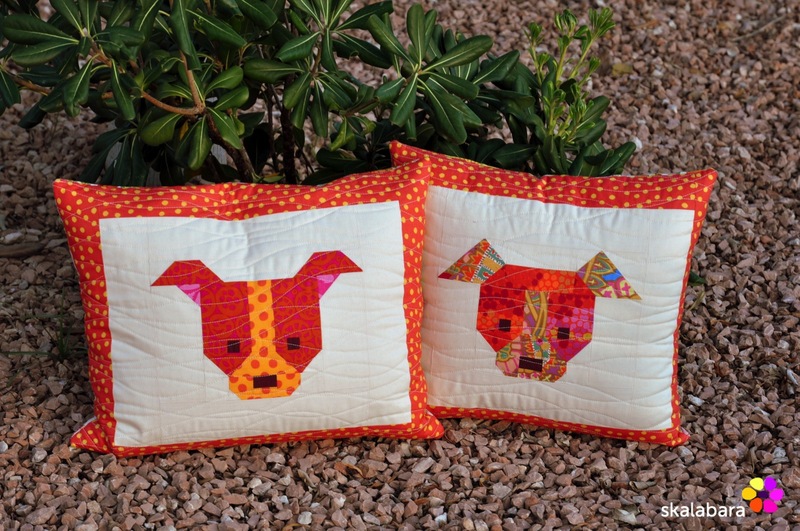 The other two mini quilts I have made are with squares that Kate has received as samples from Makower Fabrics. 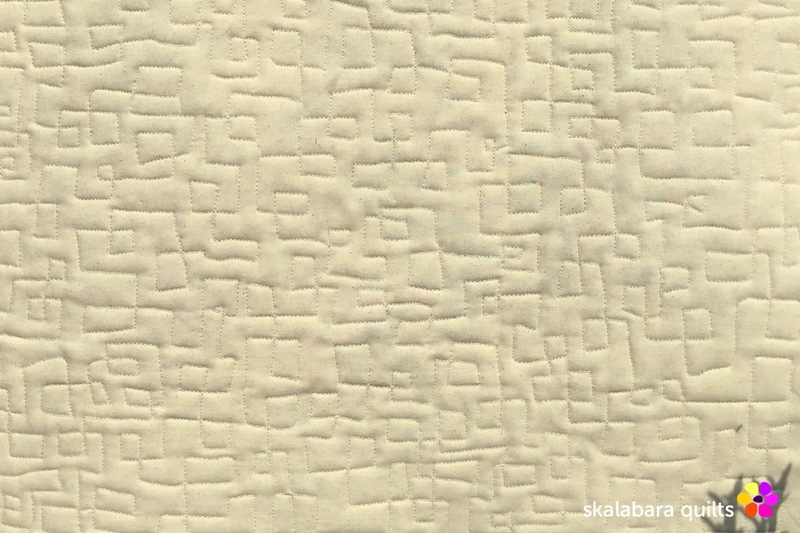 I have decided to use the same design but different quilting. 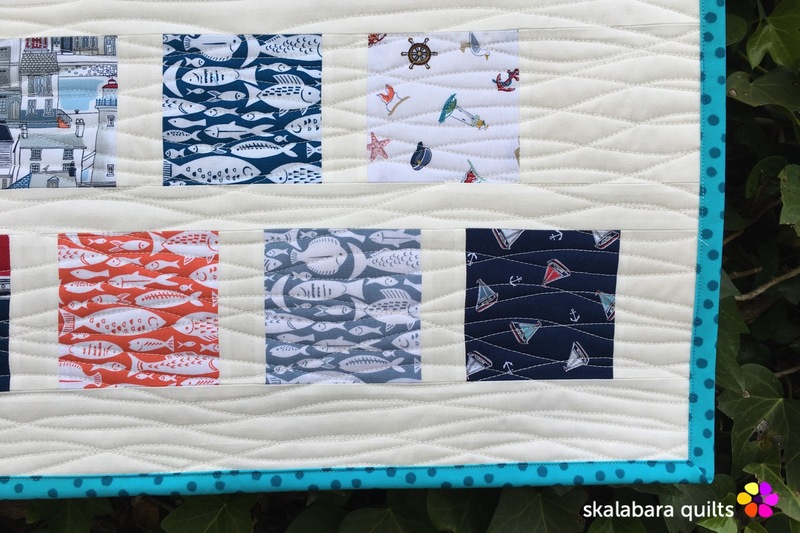 The Marina mini quilt is quilted with the walking foot with a wavy design. 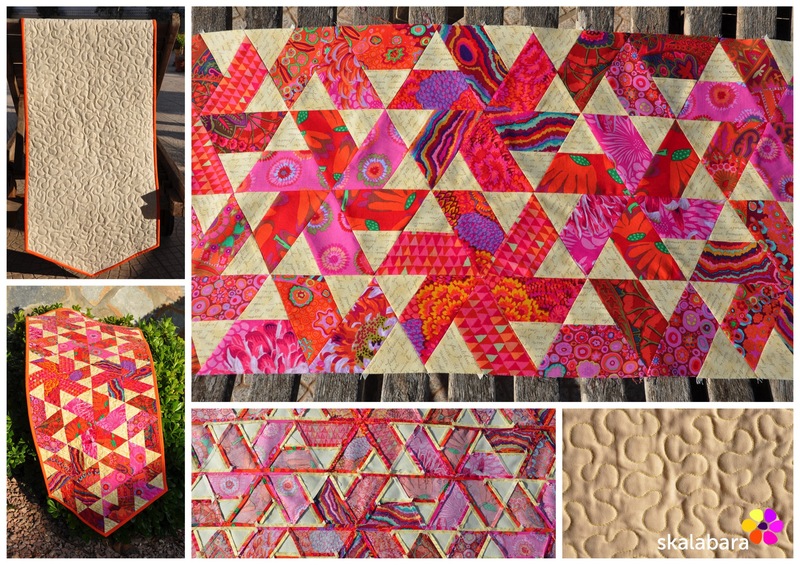 The Fantasy mini quilt is quilted with the free-motion squares/rectangles all over design. Well, I have to practice this one! Thanks for stopping and enjoy quilting! Wow, hello everyone! I haven’t posted for some time, but this doesn’t mean I have stopped with patchwork or quilting. I have fully enjoyed my August holidays that I divided between 2 weeks in Prague and 2 weeks at home. I went back to work in September, both in the office and teaching patchwork and quilting. September was filled with visitors that came to see us after the hot months of July and August. With October nearly over I am slowly getting back to my normal routine. 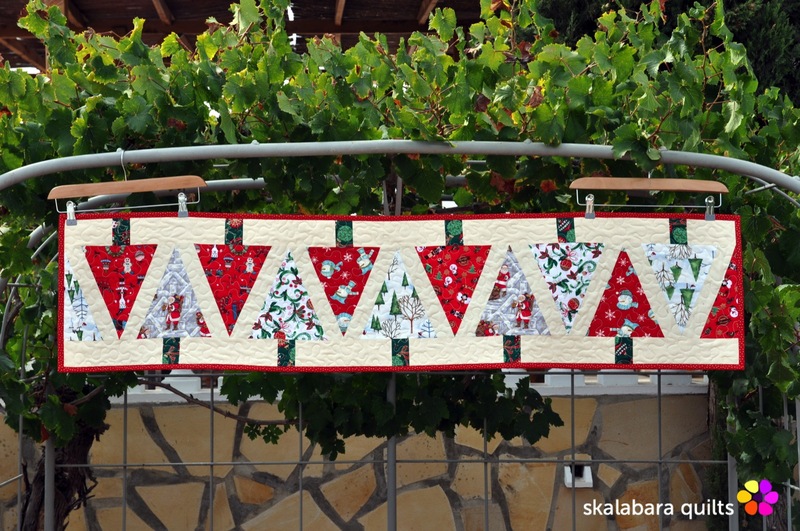 A lady from my quilting classes send me a photo of a table runner with this design that she liked on Pinterest. As there was no pattern on the web, I started cutting fabrics and piecing until I got all the measurements right. It is a straight forward design, a table runner that you can make in an afternoon. I found this pattern for place mats and a matching table runner in a quilting magazine, but can’t remember which one it was. 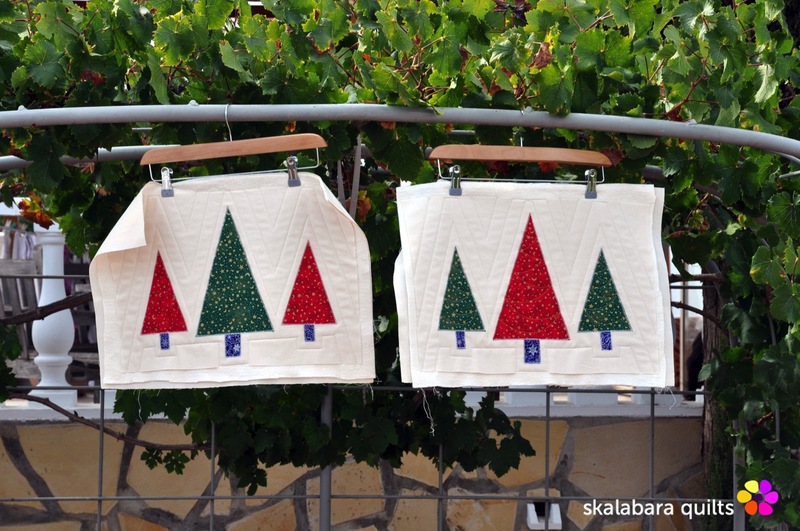 It is quick and easy design with appliqué. 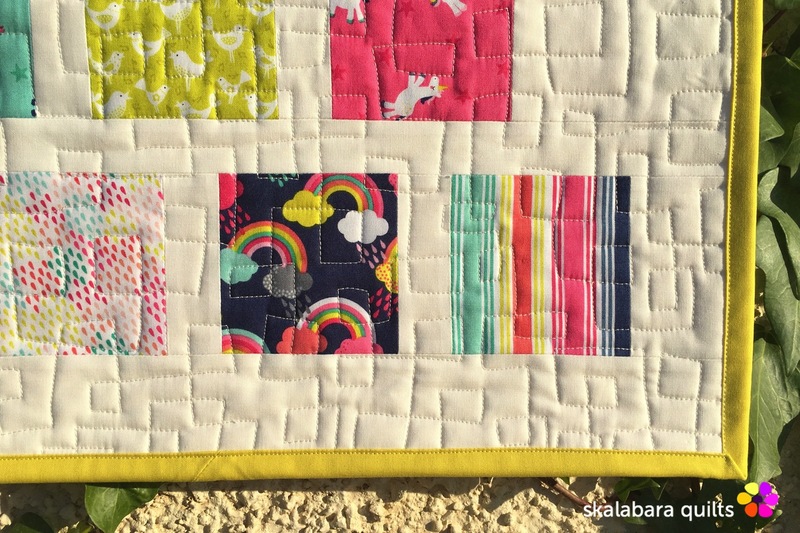 Below is a photo of version #I of the mini quilt. But I wasn’t satisfied with the design, I thought that the Christmas tree glass ornaments and the present boxes turned out too bulky. So I refined the design – see the photo above with version #II. 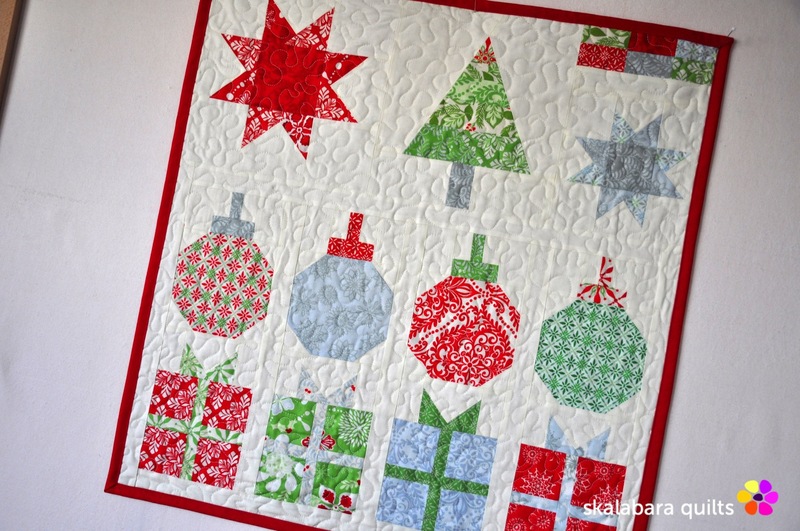 Some older Christmas mini quilts that I made over the years and shall donate all of them for charities in our area. More animals after the hedgehogs! It was such fun to work on the “large” hedgehogs, that I decided to do some smaller ones. I used the idea from Elizabeth Hartman’s website and made pillow covers with a hedgehog between two foxes. The real Mickey cat is enjoying his animal company! 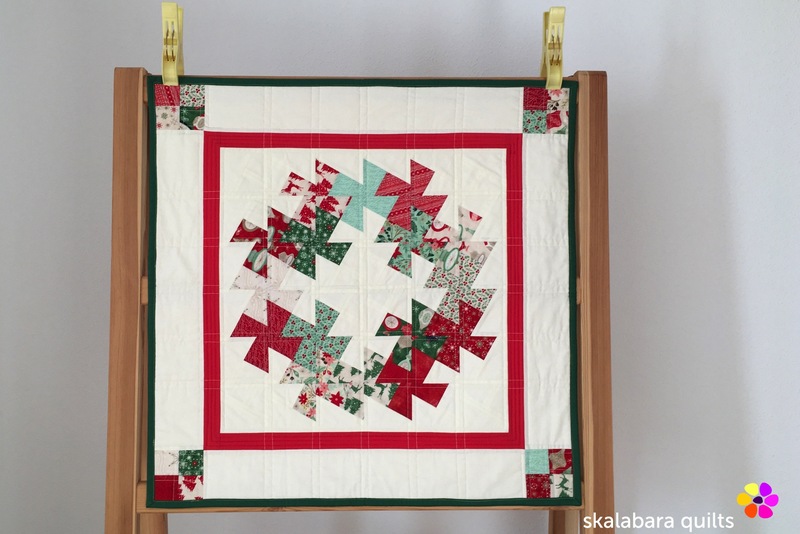 The fox block was sewn quickly as there are not so many pieces. To get a good result when sewing the small hedgehog, I started to check the unit sizes after each step. So when I sew all units together that they match. The small hedgehog as an ideal block to train an exact 1/4″ seam allowance and precise pressing. Anyway it was fun to see how the block comes together. The hedgehog/fox pillow covers are free-motion quilted – stippled. 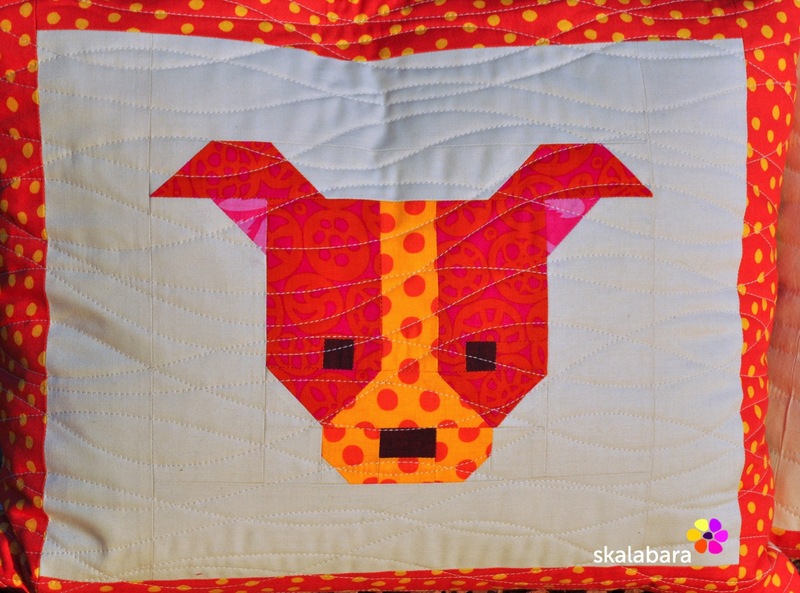 Since I have passively followed the Dog Gone Cute quilt along by Lorna from Sew Fresh Quilts, I thought it was time to make some more hairy friends. 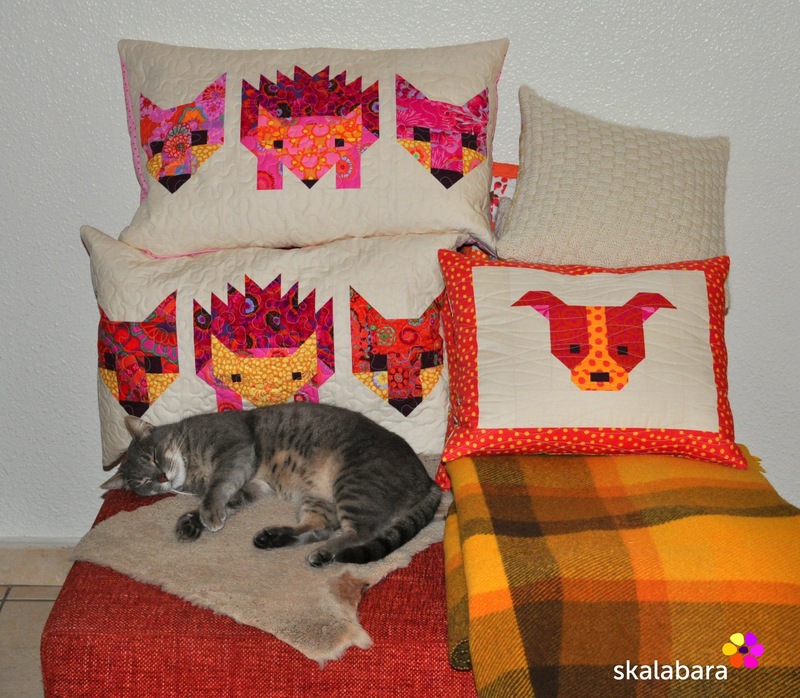 I decided to make some pillow covers that will stay on our sofa. As I am a big fan of Kaffe Fasset, the fabric choice was made quickly – both for the hedgehog/fox and dog blocks. 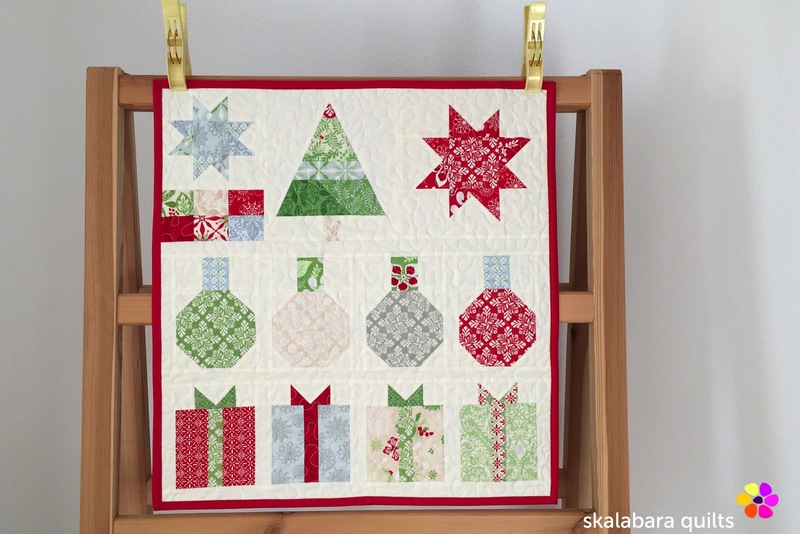 Lorna has made a superb job with the pattern, it is understandable and easy to follow. 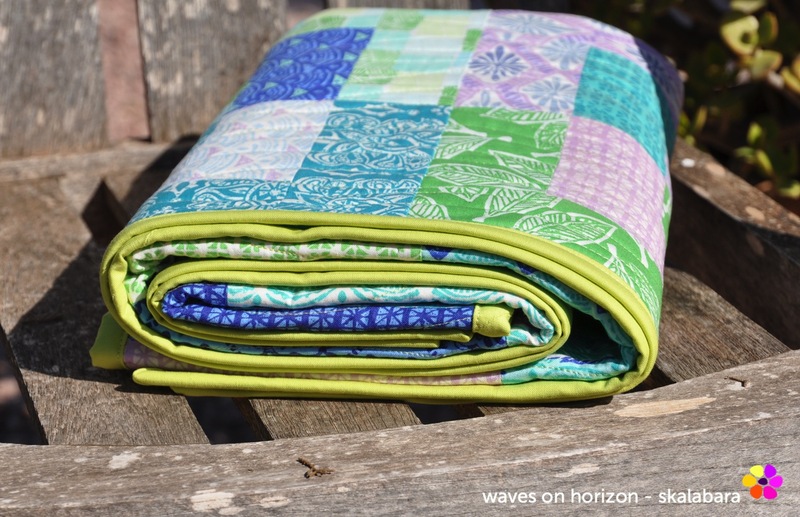 I have quilted these covers using the walking foot in an irregular wavy pattern. 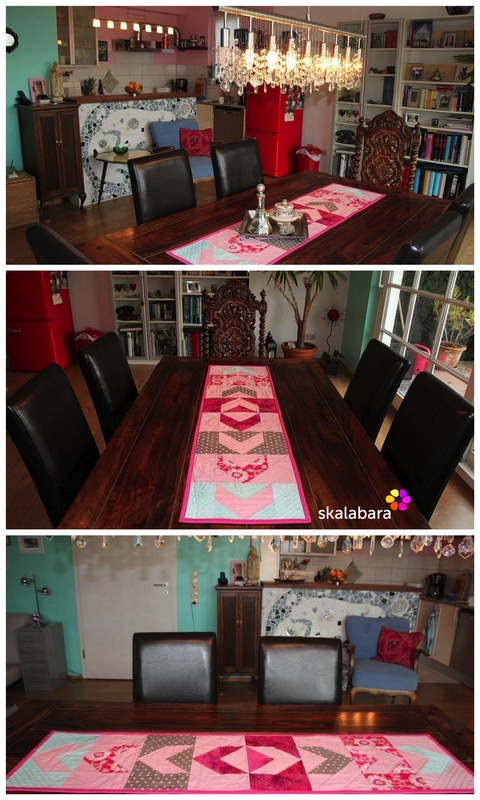 On this place I would like to share photos from Andrea of the table runner I gave her. Andrea likes bright colors and it can be seen also in here home. Love it! This is my last sewing project in 2015, I am slowly getting packed for my trip to Prague. I have sorted out my stash, cleaned up my sewing room and I am getting ready for the festive season. When Andrea came to visit us this summer, she had brought some fabrics with her to sew a pillow cover for her sofa. There was enough material left over to make a table runner. I came over this pattern for a table runner and coasters by Laura Jane Taylor called ModernGeometrics and I really liked it. I made 8 blocks with flying geese as in the pattern but at the end I went for a different layout of the blocks. Once more I quilted this table runner in straight lines following the pattern with the walking foot. The other table runner I made is for my sister-in-law. 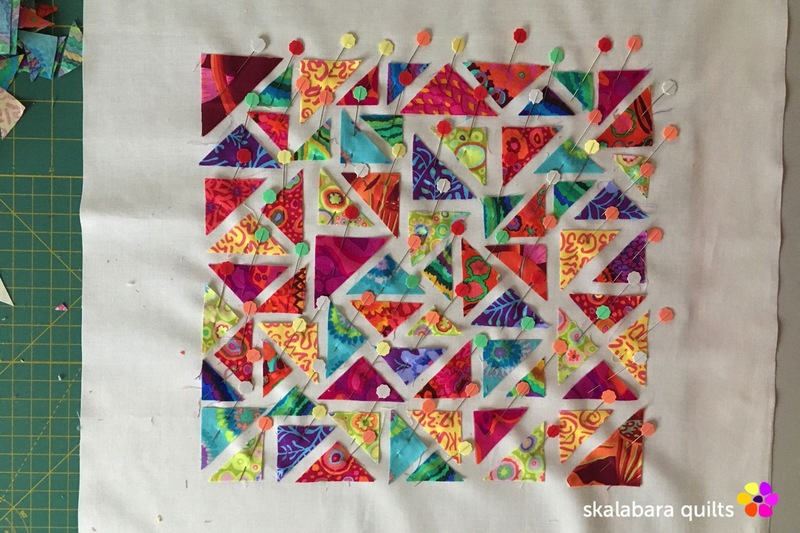 She likes bright colors and this table runner brings colour on her kitchen table. 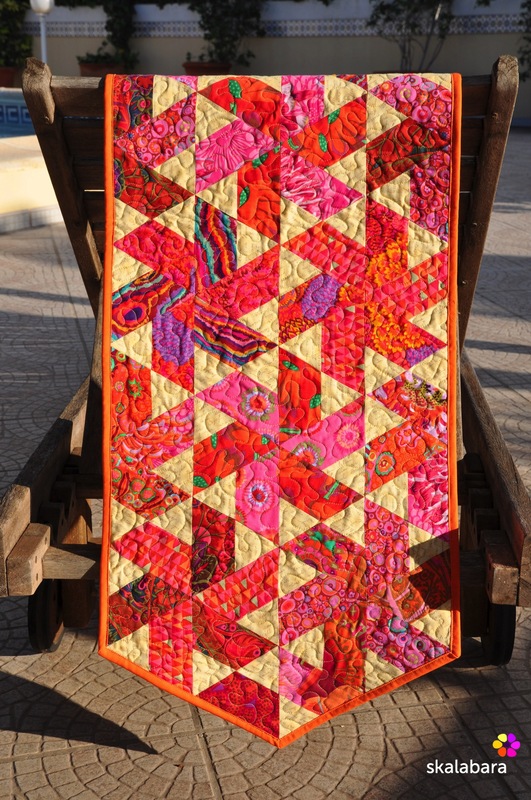 I have used a variety of Kaffe Fassett fabrics from my stash. To cut the fabrics I have finally made use of the Hex N More ruler from Jaybird Quilts. 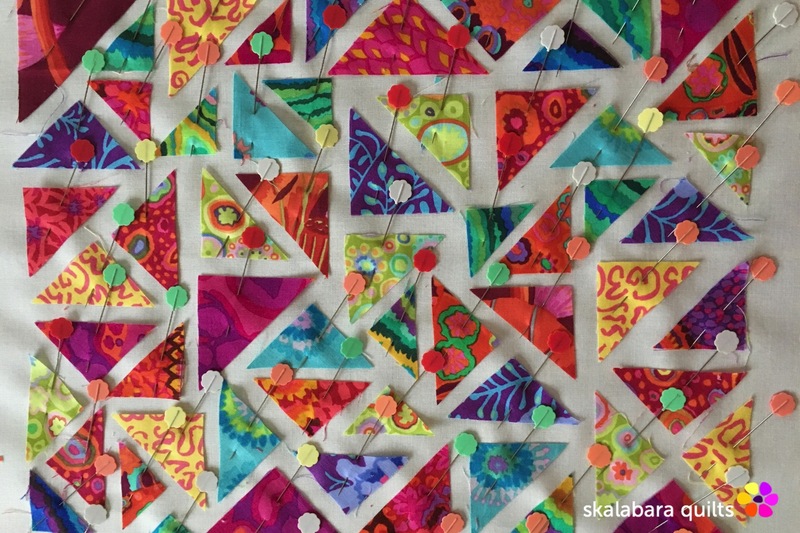 The pattern is like Tiny Dancer, but to finish each block I have used two different fabric patterns. It was a pleasure to piece this table runner, all seams came well together and have matching points. 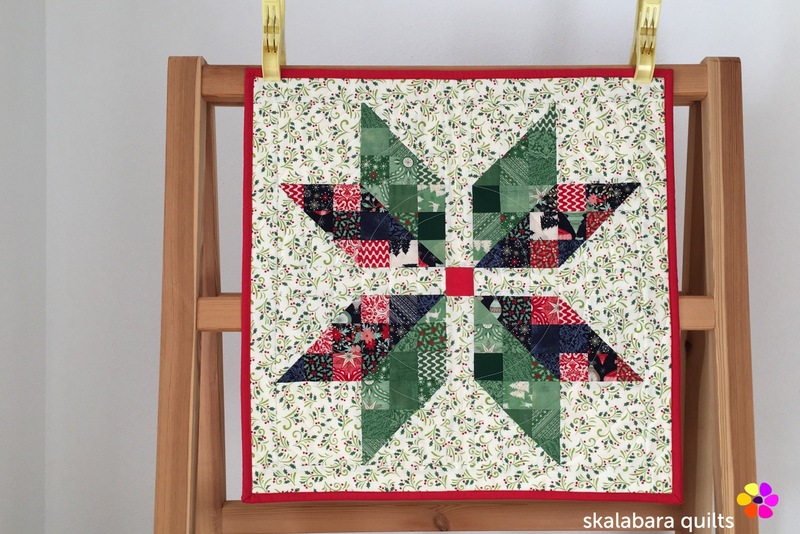 This time I decided to get out the quilting foot and practice some free-motion quilting. 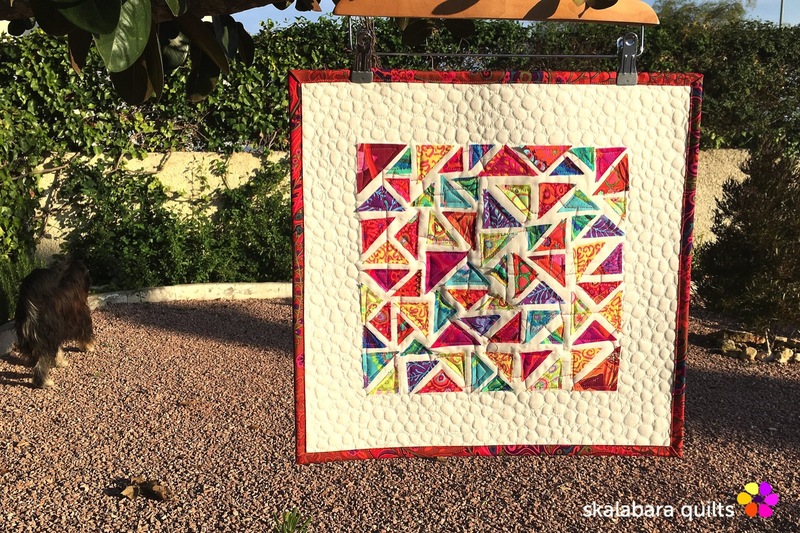 Finally a finished quilt! I had this baby quilt top some time on my to-do list. 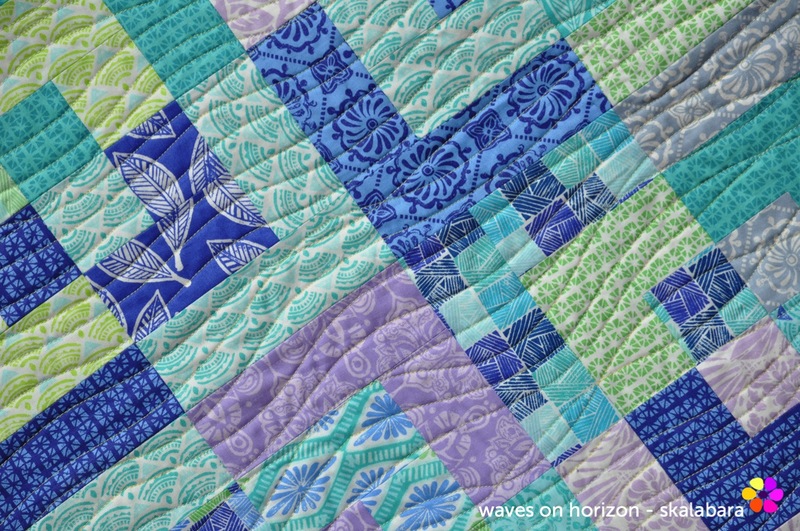 I have used jelly roll strips from the Horizon collection by Kate Spain. The quilt design is with bento box blocks, here a pattern for a table runner bento box. 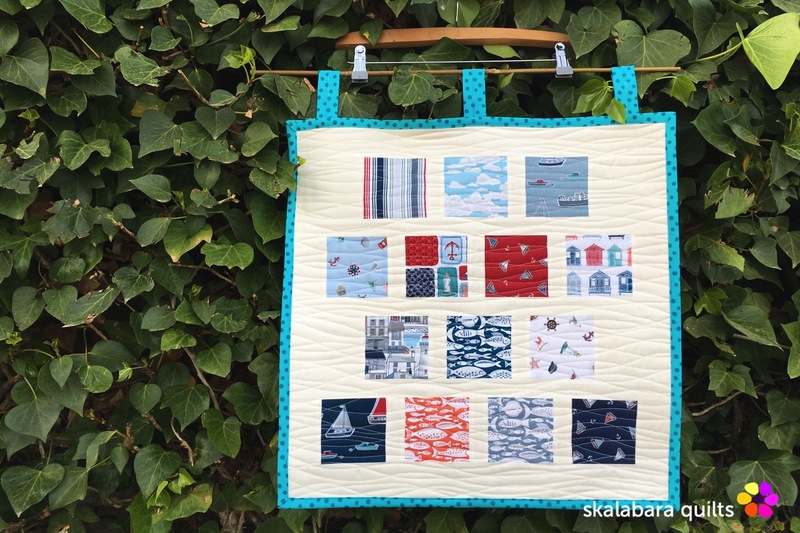 I have pieced 12 blocks to make this quilt that is ideal for a baby or toddler. 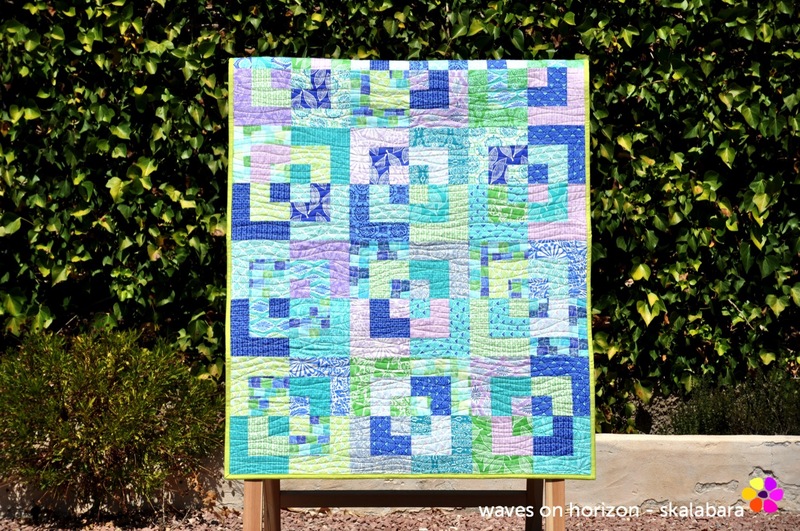 As the blocks are so square I decided to give the quilt a finishing touch with waves. 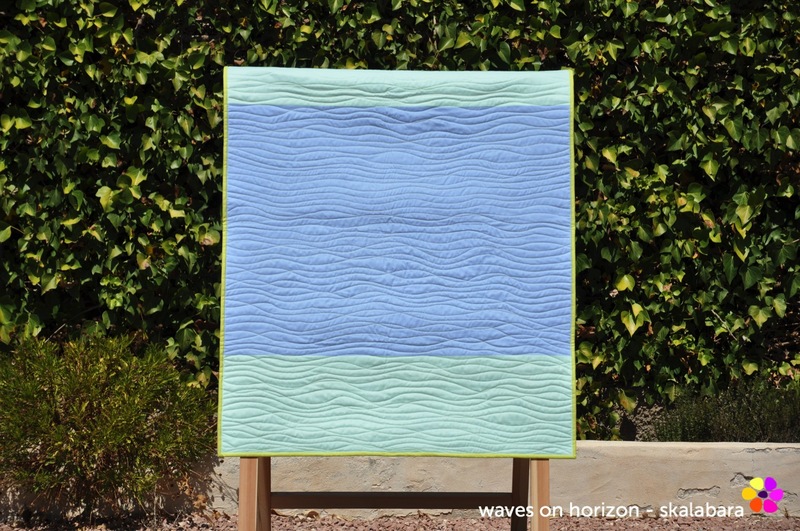 I call the quilting design free-style waves – using the walking foot but with some deliberate movements in the wave design. The binding is in solid lime.